At Crafco We SOLVE problems! With over one billion pounds of roofing and waterproofing component materials in service nobody understands the roofing and waterproofing industry like we do. 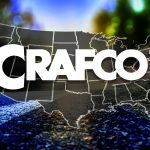 Crafco is the largest independent manufacturer of polymer modified asphalt materials with over 40 years of manufacturing experience and approaching one billion pounds of roofing and waterproofing components produced. Challenge Us to Solve Your Problem! If you have a roofing or waterproofing need, we have a dedicated team of highly experienced engineers with over 100 years of combined industry manufacturing experience using state-of-the-art equipment and facilities. For over 40 years we’ve solved our customers’ roofing and waterproofing needs by working collaboratively together to find the best possible solution. 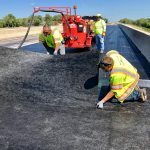 Our customized products made of asphalts, polymers, resins and oils in any volume to meet not only meet our customers proprietary requirements and provide them with the highest degree of confidence that our products are of the highest quality in the industry. How can we help you? 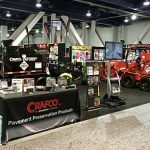 For more information call us at (800) 528-8242 or complete the form and a Crafco Technical Product Specialist will contact you. Water kills roads and bridges. Corrosive chemicals seep through the pavement eroding the structure, corroding interior metal supports. Waterproofing the bridge deck can prevent water, chemicals, and debris from reaching the structure, extending the life of the bridge and avoiding costly repairs. We are THE leading company that excels in manufacturing high quality components for use in asphalt shingles, built-up styrene-ethylene/butylene-styrene (SEBS) roofing (BUR) and waterproofing industries serving manufacturers, and users of toll-manufacturing or private label products. We test each and every solution in 1 of 7 state-of-the art laboratory facilities allowing us to replicate our customer’s environment. Our customers can have the highest degree of confidence that the roofing/waterproofing product they receive meets the highest standards of quality in the industry.